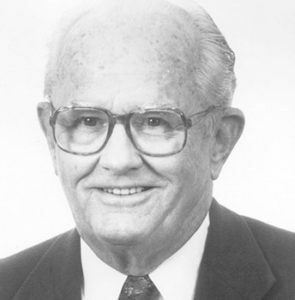 Fred Anderson was the founder and chairman of the board of Pacific Coast Building Products, Inc., a privately owned company involved in the manufacture and distribution of building materials. Head-quartered in Sacramento, the company has over 50 manufacturing plants and distribution centers throughout he western states. Pacific Coast Building Products, Inc. has annual sales of approximately $500 million and employs more than 2,500 people. Fred gave over 20 years of service to the community. He served on various boards including the Elk Grove Unified School District, Sacramento County Planning Commission and the Sacramento Municipal Utilities District to name only a few. Sports has played a significant role in Fred's life. For eight years, Fred sponsored the Sacramento International Air Show. He was managing general partner of the Sacramento Gold Miners and San Antonio Texans; Sacramento Surge; majority owner of the Modesto A's, and held a minority interest in the Pittsburgh Pirates and Sacramento Kings. An athlete in school, Dave coached football, basketball and baseball during his tenure as a teacher. He later organized Pacific Coast Building Products and its employees to actively support he Senior Gold Rush at Rancho Murieta and numerous other charities in the area. He annually sponsored the Sloughhouse Country Fun Run which benefits a scholarship program at St. Francis High School. Fred and his wife Patricia of 53 years, had five children, Jim, John, Chris, Carol, and Cathy, and 14 grandchildren. After a lifetime of leadership to the Sacramento community, Fred Anderson passed away in 1997.